National tobacco demand in the UAE is expected to slump by 40 per cent after a new 100 per cent excise tax on cigarettes goes into force October 1, say health and tax experts. An effective doubling of prices for a single pack of cigarettes will not only help boost national health coffers to fund public health services, it will also jump-start a healthier population by reducing cancer-causing products and their long-term diseases across the country. The World Health Organisation is lauding countries such as the UAE for imposing heavy excise taxes to curb tobacco demand and boost health. To date, only 33 countries — representing 10 per cent of the world’s population — have imposed punishing “luxury taxes” on citizens who smoke, said the organisation. “Tobacco taxes are the most cost-effective way to reduce tobacco use, especially among young and poor people. A tax increase that increases tobacco prices by 10 per cent decreases tobacco consumption by about 4 per cent in high-income countries and about 5 per cent in low- and middle-income countries,” said the WHO in a statement. When taking the WHO formula and multiplying the percentage increase by 10 times to meet the 100 per cent excise tax coming into effect in the UAE, cigarette sales should fall accordingly to 40 per cent. The drop will sharply cut the prevalence of smoking among people aged 15 or more, which according to WHO figures, stands at 28.6 per cent of males and 0.7 per cent of females in the UAE’s 9.3 million population. Rakesh Pardasani, Partner, RSM — Audit & Tax Advisory Firm, is a non-smoker and concurs with the WHO math, noting that a 40 per cent decline in sales is a safe estimate. The “price elasticity for cigarettes as per studies is 0.4 which means for a 100 per cent increase in price, the demand should fall by around 40 per cent,” Pardasani told Gulf News. Based upon historical tax data, he said that sudden large spikes in excise taxes encourage smokers to save money and their health. But he noted that it also takes time for tax regimen changes to fully sink into a society. “They take some time to show results. This is because of a few factors. One is that such a price increase may not dissuade regular smokers by much, but it does discourage beginners from starting the habit. Secondly, the impact of price rise is felt much more on young adults because they do not have higher incomes and they aren’t totally addicted yet. The move to curb cigarette use is the latest in a long string of antismoking measures enacted across the country since the UAE became a signatory on June 24, 2004, of the WHO Framework Convention on Tobacco Control. In its country profile included in the WHO Report on the Global Tobacco Epidemic 2017, the authors gave the UAE high marks for numerous antismoking measures such as health warnings on cigarettes, stop-smoking campaigns, complete ban on tobacco advertising, promotion and sponsorship, medical cessation treatment as well as smoking bans in public areas such as hospitals, schools and universities. 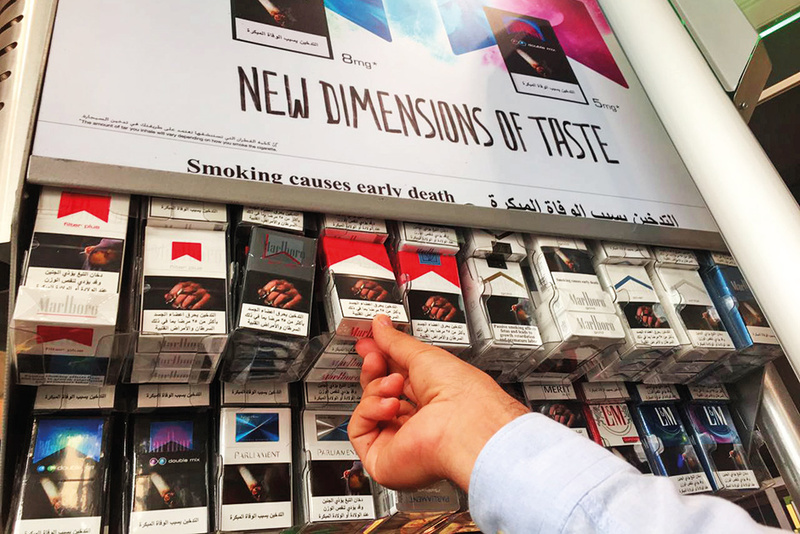 The WHO report found that the lowest “tax inclusive retail sales prices (TIRSP) for a pack of 20 cigarettes” was Dh3 for the Lucky Strike brand while at the premium end, the TIRSP for a 20-pack of Marlboro stood at Dh11. On the latter cigarette, the existing taxes amount to 18.2 per cent of the price from import duty imposed when entering the country, the report revealed. Total import duties imposed on all tobacco products entering the UAE in 2011 amounted to Dh605 million, the WHO said. • Tobacco kills more than 7 million people each year around the globe with 6 million deaths attributed directly to smoking and 890,000 deaths attributed to second-hand smoke.